Learning how to potty train kids is no joke. It can involve lots, of time, patience, rewards and genuinely losing your mind. Using a potty training system like this not only help keep you calm when you’re going through potty training, it can give you a plan you actually look forward to. This system will help you to establish the basics of potty training in about three days, but the process also continues to help support you and your child in the learning process. Look, I thought I was doing alright at this parenting thing until I started potty training my little kid when she was a toddler. I thought we were there. Showing interest in the potty, check! We have a kid-sized potty, check! I’m enthusiastic and encouraging, check! I tried showing by example, not my finest moment but kids are always watching you when you’re a parent. I tried letting her run around the backyard with a tiny potty in the backyard, she’ll get potty training eventually right? I tried letting her watch the iPad, which just ended up with us watching countless hours of Elmo. Cute but didn’t work on its own. I tried giving her snacks that helped encourage her to go, which she ate happily but didn’t lay down a foundation. Part of the problem was I tried doing all of these things on their own but wasn’t overlapping them consistently. When I got frustrated there wasn’t anything to fall back on, and we’d take three steps back. I needed a system. There are many similarities between teaching your child to potty train and helping your child when they are a picky eater. 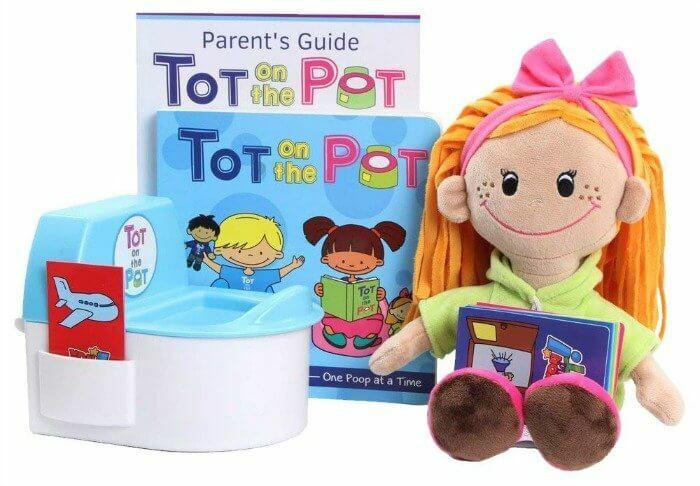 Tot On Pot gives you that system as a parent. This is a serious parent secret weapon to having potty training go smoothly. The product consists of a doll and pretend potty sized for the doll your child can use for this potty adventure, an adorable book to introduce your child to their new potty, and activity cards to reward your child when they have success. The first thing Tot on the Pot has is a very encouraging parent guide that holds your hand and walks you through the entire process. This is basically the equivalent of a Disney Fast Pass. Jump to the front of the potty training line, cause this book walks you through all the steps you need. The doll is also amazing for kids to learn by pretend play and mirroring. Children can set the super cuddly friend on their own miniature potty. The dolls are available both as a boy or a girl and in a few different skin tone options. Tot on the Pot also includes activity cards are a definite bonus to the system. Once your child uses the potty, they can flush a card in their pretend potty and get to do the fun activity on the card. This was a huge bonus to any kid, because not only is the activity fun they LOVE putting that card in the potty. Like after watching my friends daughter try this system, I’m not sure she could be more excited about those cards. You will need to still purchase your child a child-sized potty, as the potty included is for the doll. This just means your kid can pick at their favorite color. You’re going to need more than one kid-sized potty anyways. I always suggest checking out Ikea. They have a great tiny potty that lived in my trunk for literally five years in case of emergency. I think I paid only a few dollars for it. Just add paper towels, toilet paper, and plastic bag and disinfectant for and emergency car potty. You will also need some patience. Maybe a treat for you too. 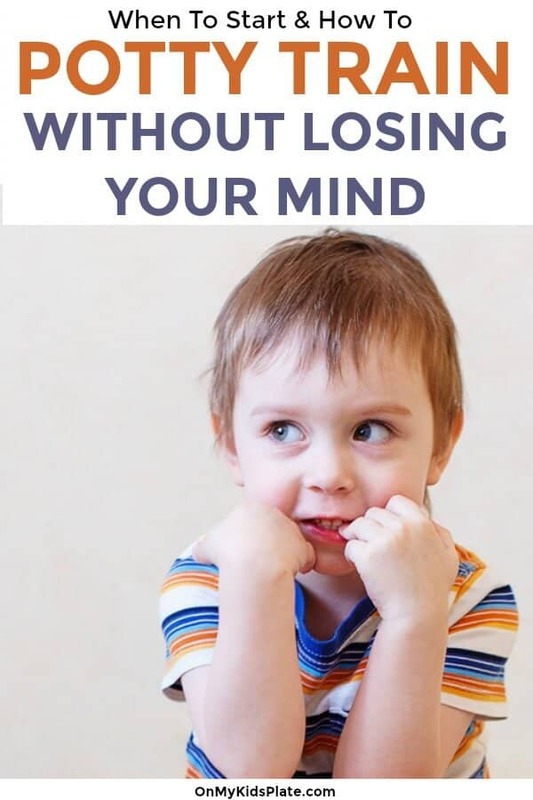 So if you’re losing your mind potty training too? Or maybe you’re ready to start potty training your kid. Breath, stop and get a system. Tot On The Pot gives parents a system and a solution to potty train their kid with solid advice and less time cleaning the rug. Are you potty training your kid right now? Ask your questions about potty training below in the comments, we can help!